When it comes to wedding table settings, there's little doubt that you will want to create beautiful place settings for your guests. On today's market, there is a multitude of different items that you can source to achieve this, but some items in particular provide you with that luxurious finish that will live long in the memory. Table settings comprise a range of different components, including cutlery, glassware, event crockery, table linen, centrepieces and others, for instance. Of course, luxury does usually come with a premium price tag, and everyone has a certain budget that they want to stick to. Here at Event Hire UK, we are able to offer you the complete range of glassware, cutlery and so on in a variety of different ranges and styles, which also hit different price points. Yes, if you are looking to hire affordable wine glasses and champagne glasses, then we can service this requirement in the form of our Savoie stemware range. But, at the other end of the spectrum, if you want to hire luxury glassware, then our gold rim and silver rim stemware ranges may well fit the bill. In the same vein, you can hire stainless steel cutlery in a variety of ranges, with traditional Kings cutlery hire being the most affordable, working its way up through different price points with our Ellipse cutlery range and Mercury cutlery range. 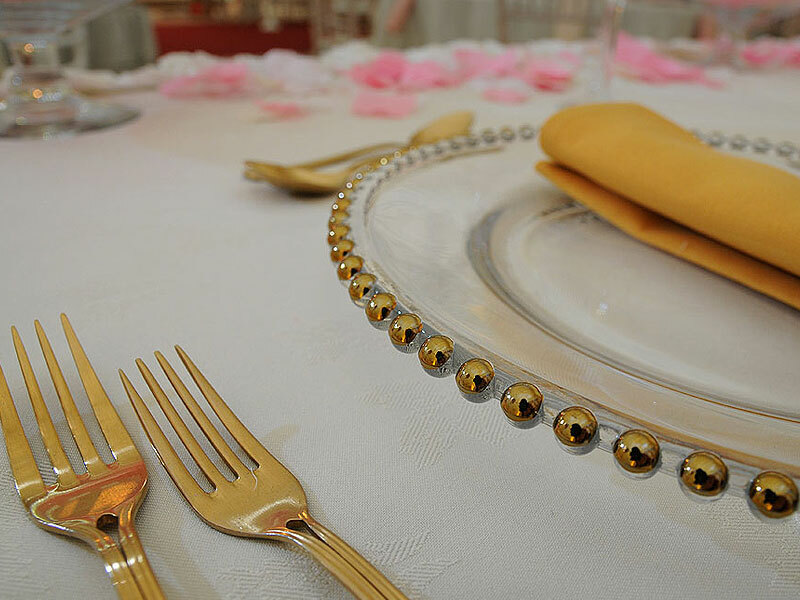 We also, however, hire gold cutlery as well - and indeed fine dining black cutlery hire - providing your tables with all important WOW factor and enabling you to achieve the look and finish for your weddings tables that you want. The same can be said for event crockery, with a variety of different ranges on offer such as plain white Lubiana crockery hire through to Royal Doulton, and then upwards towards our premium glass plates hire and coloured charger plates hire. We understand that each wedding sand event is unique, and that's why here at Event Hire UK we strive to provide you with the complete range of style choice and price point. With over 650 products to choose from, we have one of the largest stocks of luxury glassware, cutlery and event crockery in the country from which our clients can select what works best for them. Why not find out for yourself why event organisers, marquee companies, corporate hospitality planners and private individuals turn to Event Hire UK time and time again for their upcoming events. With our nationwide network of sales and distribution centres, including our newly opened Manchester hub, we can efficiently and effectively service most requirements in a highly professional manner.